new stops for old friends! we’re happy to be back from our final trade show in sacramento. november was full of various trade shows, from chicago to la, from santa clara to san jose, we’ve been burning the midnight bus oil on the weekends trying to get the basb name out there. though i wasn’t there, apparently we saved the best for last because brian said the crowds were great and uber-responsive. but then again, why wouldn’t they be? for the first time ever, basb is offering service from not only sacramento and vacaville, but tracy and stockton too. all season long. that’s right, the bay area ski bus is now the greater bay area ski bus!!! this saturday also heralded another first for all of us here at basb, for the first time in fourteen seasons, we had our first november trip. now, brian has said that in years past, november trips were an either/or situation; either we had enough people or we had enough snow, never both. so you can imagine all of our excitement when this year we were able to send off a bus on november 21st! oddly enough, i can’t tell you too much about it as none of us in the office got to go on the inaugural trip, as brian was busy ski-dazzling in sacramento, i was busy shopping at the burton sample sale and emily was busy getting ready to be let down by da’ bears on sunday. 🙂 Luckily for all of us, we made sure to send our trusty blogger-friends Jodi and Dimitri. jodi and dimitri have both guest-blogged for us in previous seasons and this year will be no different. definitely bookmark Jodi’s Ski Tripper blog, your one-stop-blog for all things tahoe, check out her flickr account for great shots from the trips, heck even follow dimitry’s ski bus twitter:backodabus. once you pop…you just can’t stop…. 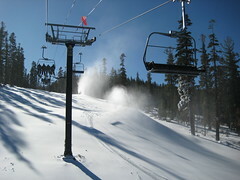 finally the most exciting news: if you’re sad you missed all the fun on saturday, we have another pre-season trip scheduled to northstar for saturday nov 28!! tickets are on sale now, $89 for ride/lift ticket/wine for adults and only $59 for just the ride up!!! check ’em out and we’ll be seeing you up there! have a happy txg from all of us at basb and we’ll see you on the slopes!